Hey, everyone! Today, I’m bringing you a review of Dark Horse’s 47 Ronin, a 2014 “Best Limited Series” Eisner Award nominee. 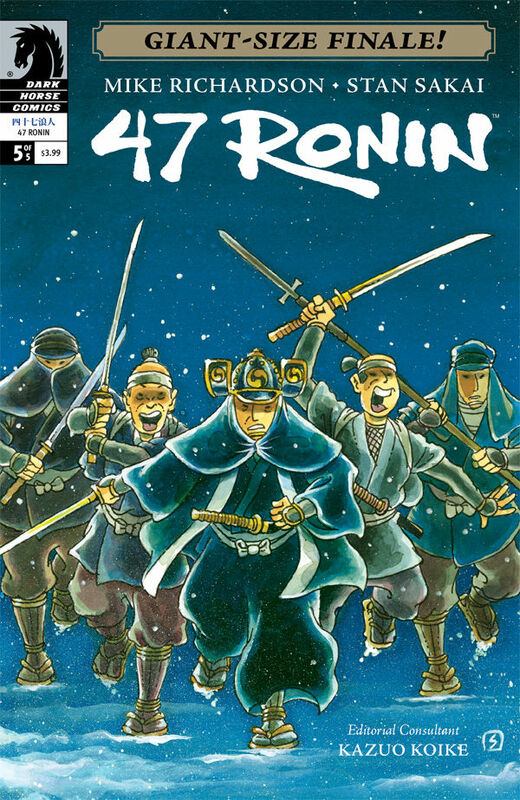 With a dream team of writer Mike Richardson, artist Stan Sakai, and editorial consultant Kazuo Koike, 47 Ronin makes noise before you even open the cover. Synopsis: This is the classic Japanese tale (originated in the early 18th century) of a group of warriors out to seek revenge on the man that ultimately lead to their master’s demise. Pros (and/or what you can use in the classroom): This is the first book that I have reviewed that I can say with certainty can be taught cross-curricular. This amazingly researched, artistically crafted story can easily find its way into social studies classrooms (And art history classrooms if there is room in the curriculum for Japanese art…because I think it would be super cool to analyze the art found on the pages of this book with classic pieces of Japanese art!). Not only is this graphic novel based on true events, but the themes and motifs are universal in the way that they connect to students in any classroom: revenge, loyalty, service, purpose, integrity, drive for success…the list goes on and on. More than the analysis of the literary elements found in the book, the discussion that can be derived from the reading seems to be exponential. As I read the book, and read it twice, the influx of ideas and thoughts that I wanted to discuss was inspiring. Cons: Can you work this book into your curriculum? That’s my biggest question. I have an amazing department with a lot of freedom with what I choose to teach; I know some people that do not. This book is not as straight-up literary as an Essex County, but it is deep, and working it in to the curriculum might be tough. Can you stick it in a “Hero” unit? Or as an introduction to a multi-cultural unit? Possibly a stand-alone, it’s the start of the year, and you want to get kids talking/discussing; I mean you could have them finish the book within two class periods (hopefully). No other cons from me here…it’s written, drawn, researched, and bound beautifully. Rating: I have to give this book a 9/10, with the one point deduction for not being the absolute easiest book to incorporate into a possibly stubborn curriculum. As far as age-range is concerned, while the book is a bit violent at times, the violence is cartoony, and I’d say junior high kids could totally read this book and get a lot out of it, but you may disagree, so as I suggest with all of my reviewed books, please read them for yourselves first! In closing, check this book out. You may learn something. You may not want to teach it. You might want to start a book club with it. It might become a staple in your classroom. This very appropriate, very engaging book should at least find its way onto your classroom shelf. Let me know if you have any questions, suggestions, or just need some ideas on how to teach this book. Happy reading!